Metal ion release from the orthopedic implants is a great concern for the clinicians and patients. Currently, the inductive coupled plasma-mass spectroscopy (ICP-MS) technique is used to detect and estimate the metal ions in the blood or synovial fluid, which is expensive and needs technical assistance. Hence, the aim of the current work is to develop a biosensor based on the electrochemistry to measure the metal release to the body fluids (blood or synovial fluid) from the implants. This will work very similar to a glucometer (by function), as a patient-driven technique, if it is optimized for the blood samples, and for clinical purpose, in case of the synovial fluid estimation. 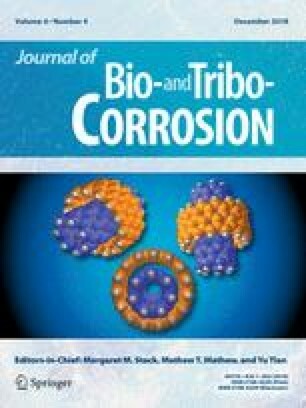 As a proof of concept effort, the present study has two objectives: (1) To study the effectiveness of using a micro-chip biosensor as a diagnostic technique for the early detection of the released metal particles in the synovial fluid solution (study 1), and (2) to investigate the corrosion kinetics of CoCrMo alloy in the presence of metal particles in synovial fluid solution (study 2). A series of tests were done with biosensor prototype with increasing concentration of metal release (particles and ions), which is generated from a hip simulator (study 1). The impedance variation (delta Z) shows a very close correlation with increased amount of metal release (particles and ions) level (study 2). Although the study has several limitations, the initial findings indicate that a biosensor could be developed as a diagnostic tool to detect the metal release (particles and ions) levels. The authors would like to thank NIH (R03 AR064005), NSF (FDN 1160951), Prof. Kunze, Hamburg, Germany (ICP-MS metal ion estimation) and Dean’s Fellowship (RUSH). Special thanks to Dr. Michel Laurent (Rush Orthopedics) for the valuable suggestion to improve this project and other collaborators of this project Prof. K. Shull (Northwestern University), Dr. Danieli Rodrigues (UTD, Dallas) and Dr. Asimina Kiourti (OSU, Columbus).